Santa to arrive bringing loads of toys with him. Barbie's little sister is no exception to that either. Peppermint Kelly had a few of her friends join her for a photo session to celebrate the Christmas holidays. Some Hello Kitties wanted to be part of the fun along with some darling holiday themed Legos. I really hope you enjoy this festive holiday photo. This will probably be my last post for the Christmas 2012 year. I really appreciate all of my followers and those of you that have stopped by to visit and leave comments. Thanks so much. Merry Christmas to all of you, and may your holiday season bring you love, peace, and joy. Christmas trees with their sparkling lights, and all the beautifully wrapped presents under the tree. presents. I couldn't wait for Christmas to arrive, and I think that's true for most children. Time seemed to really drag as a child, but now the holidays seems to come around faster and faster each year. Not that that is a bad thing at all, but it does mean the years are quickly passing by. to drop in for a visit anytime he would like. Hopefully it means he will bring some presents with him. years ago. 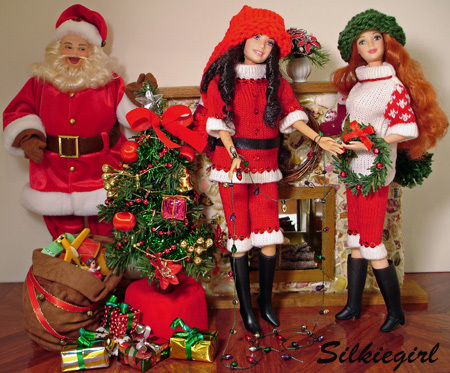 You just never know when you might come across some ornaments that will fit your Barbie sized dolls perfectly. Santa is the Coca Cola Santa from a number of years ago, and I just love him. Santa is saying his goodbyes, because he has so much to do before the big night. Not only does he have to load his sleigh with lots and lots of presents, but he has to make sure his sleigh and reindeer are in tip top shape for the long journey ahead. 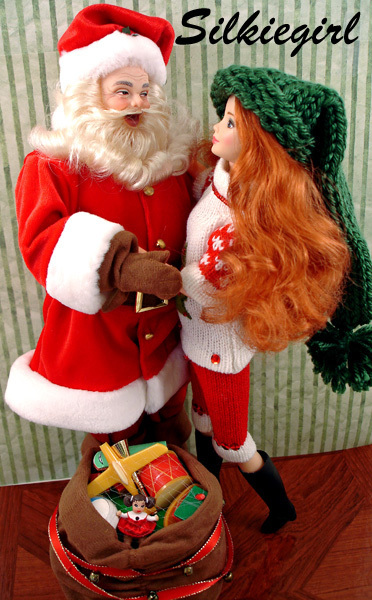 My favorite doll, Bevin, is giving Santa a hug goodbye and wishing him a very safe journey. 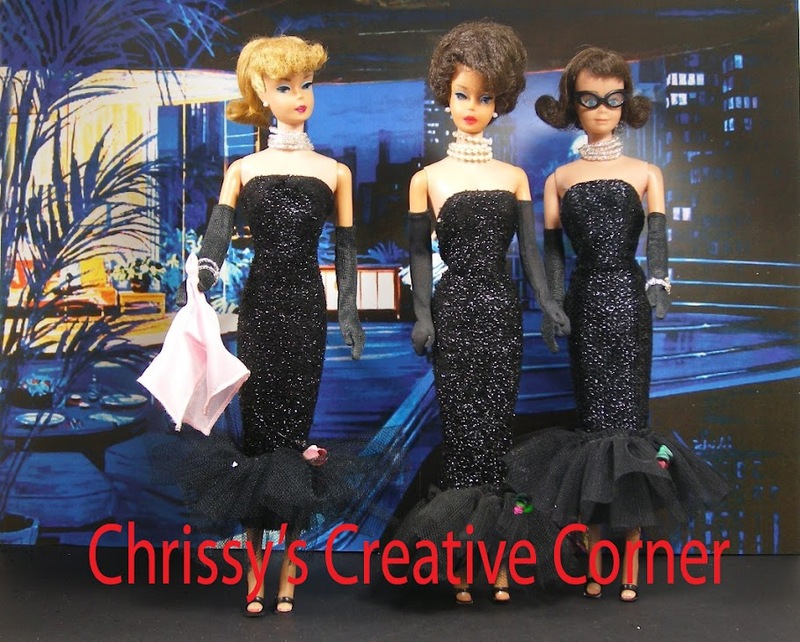 In case you are wondering, Bevin is the KB Toys Fashion Avenue Barbie. She now has an articulated body, but the body she has in this picture is what I call the belly button body. The dark haired beauty in the top picture is a Fashion Fever doll. I believe Mattel named her Raquel, and I haven't changed it. She came in a slim round tube wearing a purple sleeping ensemble. I just love her long dark curls. Well....I think that's my post for the day. I hope I can squeeze in another post before Christmas. It's only 2 weeks away from today. So much to do and so little time. I hope you enjoyed this post, and I invite you to leave me a comment. Can you believe that it's December already? It really seems like we just celebrated the holidays not that long ago, but here it is again. Christmas and the holidays are upon us once again, so it's time to prepare for the joyous days ahead of us. 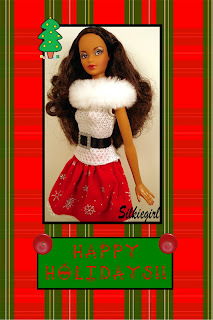 Today I thought I'd share my AA Birthstone Beauty Barbie wearing a fashion that came on a Target exclusive holiday Barbie. I think this beauty looks so adorable and festive in this cute fashion, and she is definitely ready to attend some very festive occasions during the holiday season. So....here she is to wish everyone a very happy holiday season. I hope you like her. Thanks so much for stopping by and visiting. Until next time, enjoy the month of December and all the joy and good wishes it can bring.